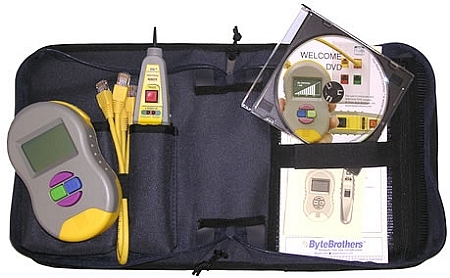 When looking for test equipment, the ByteBrothers Real World Certifier offers more than your typical LAN and cable testing. It allows you to check if your cable is wired correctly and to determine the speed at which your cable is capable of operating. 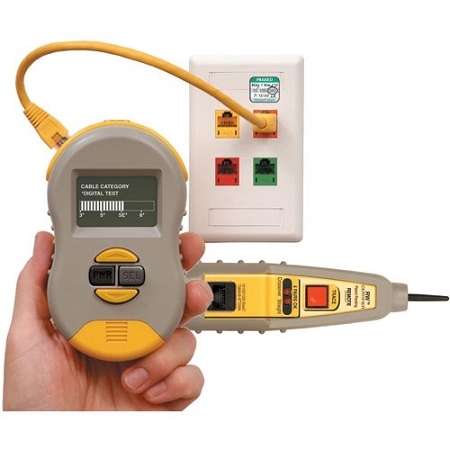 Equipped with the ability to perform standard cable tests, this test equipment allows you to determine the type of cable utilized (Cat 3, 5, 5e, 6). It also comes with the ability to perform speed tests on cables, switches, hubs and PCs and the ability to view the results on clear easy-to-read graphs. The ability to store the readings of 250 tests for later printing makes this Real World Certifier a must have. Click the "More Information" tab for additional key points. Uses real data from hub, switch or PC to display port speed, duplex, data levels of all pairs. Are you looking for a reliable way to tell if your cable is wired correctly? Do you need to know the speed at which your cable is capable of operating? Then the Real World Certifier may be the perfect solution. If you are wondering exactly how the Real World Certifier works, let’s cover a few key points. The Real World Certifier arrives at Cable Type (Cat 3, 5, 5E, 6) by using digital testing techniques. It also looks at the speed capability of the cable (10MB, 100MB, and 1000MB). The testing is broken up into “Level 1” and “Level 2”. Level 1 test transmits simulated digital data to the remote probe unit on the far end by using the Real World Certifier Main Unit on the near end. Tests performed will report a “Pass/Fail” result and other tests give timing measurements and Cable Typing (Cat 3, 5, 5E, 6). This level also gives the “projected speed” graph of the cable (10MB, 100MB, and 1000MB). The primary difference between Level 1 and Level 2 is that on Level 2 the device on the far end is a hub, switch or PC. The Real World Certifier at the near end analyzes the LAN device at the far end transmitting real digital data. In the event that a Gigabit switch or other 1000 MB device is at the far end, the cable is tested for speed capabilities with real data up to a Gigabit (1000 MB). Level 2 tests are limited to testing the speed capability of the device providing the data. Results are delivered as a Pass/Fail report and some tests have time measurements. The last result is a “Confirmed Speed” graph rating the cable for its data capacity. Now with a better understanding, you are ready to own what will quickly become your best test equipment unit yet! Certifier: Two piece test equipment installed at the near end and far end of a cable. Cat3: Also known as Category 3 is an unshielded twisted pair cable that has the capacity to data at a rate of 10Mbit/s and a bandwidth of up to 16MHz. Cat5: Known as Category 5 is a type of twisted-pair network cable that has the capacity to transmit data at the rate of 100Mbit/second. Limited to 328ft cable runs, CAT5 is mostly used for 100BASE-TX Ethernet networks. CAT5e is Category 5 enhanced. Cat6: Category 6 has the convenience of being compatible with CAT3, CAT5 and CAT5e network cables. As a twisted-pair cable with copper conducting wires the run limit for CAT6 cable is 295ft and is capable to perform up to 250MHz. It has a much higher standard for system noise and crosstalk than CAT5e cable.